The Jedi and Sith infuriate me. They are the same side of a spherical coin, but they refuse to see that. I have complained about my frustration with these Force users before, but usually, my complaints are within reviews of Star Wars books, games, shows, etc that point out the hypocrisy and stupidity of the Jedi and Sith perceived dichotomy. Star Wars: Legacy joins this collection. Legacy takes place 100+ years after the original trilogy and is about Cade Skywalker, who is, well, a Skywalker. If there’s a “fate of the galaxy” involved, then assume a Skywalker will be there, for good or evil. Unlike the rest of the Skywalker line, events in Cade’s life have made him choose to forget his legacy, no matter how many times ghost Luke pops by for a visit. When we meet Cade, he is a bounty hunter hiding his last name and his Force abilities and drowning his visions with deathsticks, while the Sith, Galactic Republic, Imperials and Jedi fight over control of the galaxy – and of him. Legacy starts with typical Star Wars tropes, familiar names and character archetypes that initially disappointed me because I had hoped that a series that takes place so far into the future could step away from all that. There were the cool ship and the cocky pilot and the princess and the questionable friends and the stoic Jedi and the evil Sith and, of course, a Skywalker. But once the connections to what we know had been established, the story comfortably moved on, with Cade leading the way as the atypical hero who has no interest in saving the galaxy, no matter what his name might be. Of course we know that the galaxy saving is going to happen anyway, right? But the books do a good job of casting doubt about the how and why. Will Cade give in to the darkness within him? Will he take up his legacy? Who will stand with him? The series also adds interesting dimensions with the overall politics of war and all the sides involved. 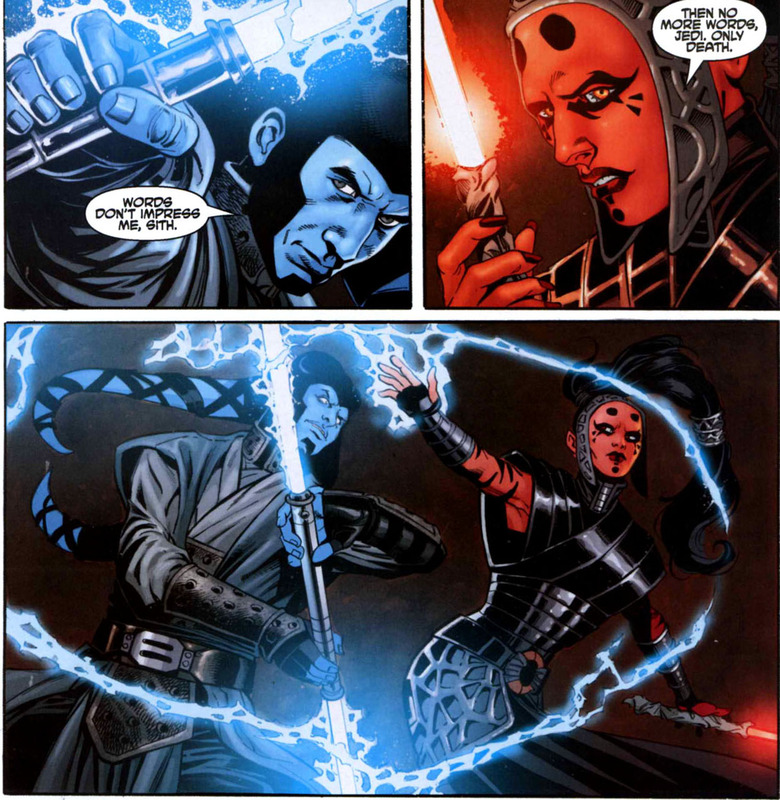 The Sith remain the official Big Bad and the Jedi the Persecuted Good, but now the Jedi and Sith are no longer intrinsically connected to the Imperial/Empire and Republic respectively. The two political factions in the middle teeter between fending for themselves, fighting within their own ranks, seeking alliances, betraying alliances… It’s not as confusing as it might seem. In fact, the politics became one of the aspects of the series that I really enjoyed, which surprised me. I also enjoyed the space battles, which don't necessarily translate well in this medium, but the battle tactics weren't overly dramatic and there wasn't any time wasted in the battle. Despite the initial comparisons to movie counterparts, all the characters develop into strong players in their own rights. There are a LOT of characters, all of which are introduced in the primers, though not all play the prominent or support roles you might expect from them. My angry feminist initially poked her head out with the primer introductions for Moff Nyna Calixte with the glass ceiling accusations, Deliah Blue, the girlfriend with a wrench and Gunner Yage, the daughter that should have been a son. But, as with the rest of the series, everything moved on quickly from the basic tropes, and even the characters that appear only briefly are well established. Well, most of them. Overall, an excellent entry into the Star Wars saga and one that anyone could get into, without knowing too much about the massive past.